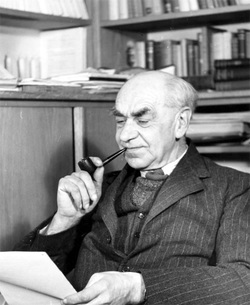 The research by Bartlett (1932) is identified in the Specification along with the concept of schemas. You need to understand these concepts and evaluate them, including how they differ from the multi-store model. It would also be helpful to know about more recent research into reconstructive memory, such as that by Elizabeth Loftus. This theory was proposed by Sir Frederick Bartlett, one of the early figures in memory research. Bartlett’s central insight was that memory is not like a tape recorder: it doesn’t faithfully play back our experiences. Instead, it changes or “reconstructs” them imaginatively. 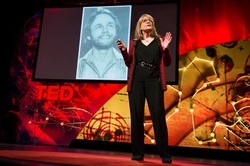 Bartlett’s ideas were neglected for decades but were brought back into the mainstream again when they were supported by experimental research byElizabeth Loftus. Loftus argued that Reconstructive Memory implies that eyewitnesses to crimes will often be unreliable. It shows how scientific research proceeds, because Bartlett’s fairly unscientific research in the 1930s was improved upon by Loftus, who mounted much more rigorous lab experiments in the ‘70s and ‘80s. It goes against the typical features of the Cognitive Approach, since it rejects the idea of memory being like the sort of information processing used by a computer - it's much more creative but less reliable than that! This is a theory with important implications for policing and the courts as well as journalism and everyday life. If memory is Reconstructive, then can it be trusted to tell us the truth? Can we trust our own memories? Bartlett’s main idea is that our memory is grouped into categories called “schemas”. We have schemas for all sorts of thing – for what a “criminal” is like, for what counts as “food” and how to behave at the service counter in a fast food restaurant. 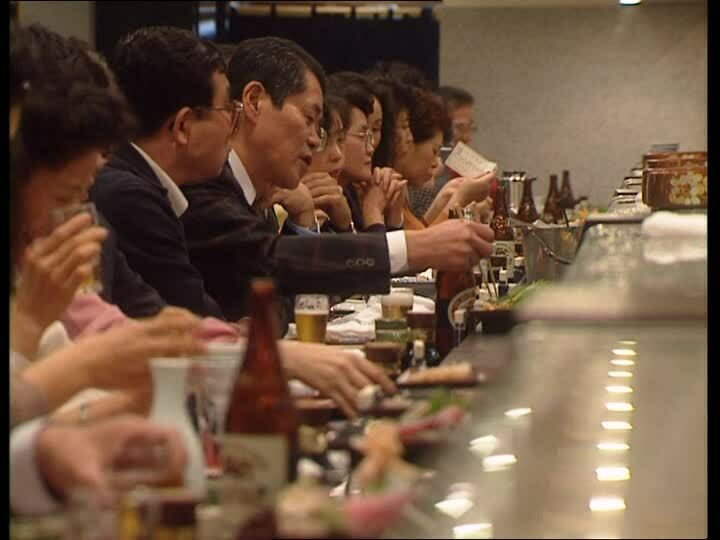 For example, in a Japanese sushi bar you might not know what behaviour is expected of you and it would be hard to make sense of what the other customers were doing and eating. But if you paid attention, you would figure it out: you would start to develop a new schema. Sometimes we accommodate new information, changing our memories to keep our schemas intact and unchanged. Bartlett explains how we do this by levelling and sharpening. Levelling involves removing or downplaying details from the memory and sharpening involves adding or exaggerating details. Memory makes use of schemas to organise things. When we recall an event, our schemas tell us what is supposed to happen. The schemas might fill in the gaps in our memory (confabulation) and even put pressure on our mind to remember things in a way that fits in with the schema, removing or changing details. For example, you might remember the Japanese diners eating with chopsticks (because that’s part of your schema for Japanese meals) whereas in reality the Japanese use their fingers to eat sushi. Bartlett came up with the idea of “reconstructive memory” during a game of ‘Chinese Whispers’. He developed a study based on this game. Bartlett showed 20 students a Native American ghost story (The War of the Ghosts) which had unusual features. He asked them to read it then recall it on several occasions after a few hours, days, weeks or even years – a technique called serial reproduction (and a Repeated Measures design). Bartlett compared how the recalled versions of the story differed from the original. Participants shortened the story when they reproduced it, from 330 words to 180 words, with the shortest reproduction happening after the longest gap (two years). Participants also confabulated details, changing unfamiliar parts of the story to familiar ideas in line with their schemas: canoes and paddles became boats and oars, hunting seals became fishing. Participants rationalised the story, coming up with explanations for baffling parts of the story. For example, in later reproductions, participants missed out the “ghosts” and just described a battle between Native American tribes. Bartlett didn’t use many experimental controls, asking participants to reproduce the story whenever was convenient. He bumped into one student in the street two years later and asked her to reproduce The War of the Ghosts there and then. The changes in the stories were also down to his own subjective opinion. 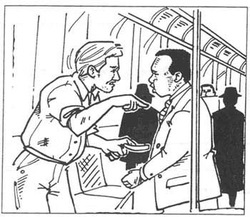 Allport & Postman (1947) showed participants a drawing (below) of an argument on a subway train. They were asked to describe it to another participant through serial reproduction (like Chinese Whispers). The black character was better dressed and more respectable than the white character but, after serial reproduction, white participants tended to reverse their appearances. Some even described the black character as holding a knife. Elizabeth Loftus revisited Bartlett’s idea of schemas in the 1970s in a series of experiments. Loftus & Palmer (1974) showed students film clips of real car crashes and set them a questionnaire to answer. There was only one critical question which asked about the speed of the cars. 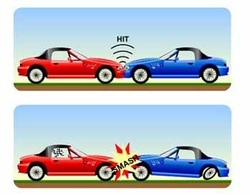 Some students read a critical question with an intense verb (“How fast were the cars going when they smashed into each other?”) but others read a less intense verb like “hit”. Participants exposed to the “smashed” verb recalled a higher speed (40.8mph on average) than participants exposed to “hit” (34mph). Loftus & Palmer tested participants again a week later, asking them if there was any broken glass in the film clip. In fact there had been no broken glass. This was falsely recalled by 12% of the Control group (who had never been asked about the speed of the cars) and 14% of the “hit” group; however, 32% of the “smashed” group falsely recalled broken glass. Loftus concludes that eyewitnesses are unreliable because they are influenced by leading questions. When we reconstruct memories, we change them by incorporating new information we learned after the incident. We also incorporate our schemas (expecting broken glass after a “smash” - this is sharpening the memory). We cannot tell which parts of a memory are original and which parts are later changes and there’s no way of going back to the original. Eyewitnesses to crimes and accidents often have to reproduce their testimony many times to journalists, the police or a court – this is rather like the serial reproduction in Bartlett’s study. You would expect levelling and sharpening of memories to happen. Eyewitnesses are also exposed to leading questions. This may come from the police (who have their own suspects in mind) or lawyers (who are trying to show someone to be innocent or guilty). If Loftus is right, this should make eyewitness testimony very unreliable, since the memories change when we learn more information. Allport & Postman also shows how schemas distort memory, especially prejudices. We remember things the way we think they ought to be. The Devlin Report (1976) concluded that British juries should not convict someone where the only evidence is a single eyewitness. Understanding schemas can help with supporting dementia sufferers. When memories are lost, the world becomes a frightening and confusing place. Schemas help us make sense of things if they can be applied. Carers may use familiar music from the past, old activities (gardening, playing games with children) or reminiscing about long ago events to activate schemas that sufferers are comfortable with. This can be seen in the “dementia village” at Hogeway. Residents choose to live and spend time in areas of the village themed around their schemas – classy and cultural, working class and rustic, urban and busy, quiet and religious. The idea that we should “go along” with dementia sufferers’ schemas is central to Validation Therapy. You can use all of this in your ﻿Cognitive Key Question﻿. The idea of schemas has been supported in a lot of studies since the 1930s. Loftus carried out a range of lab experiments into reconstructive memory, all of which had tight experimental controls, standardised procedures and collected quantitative data, making them quite objective and reliable. Schemas also explains the puzzling phenomenon of false memories. In 2005, John Charles De Menezes was mistaken for a terrorist and shot by police after the 7/7 London Bombing. Many eyewitnesses saw the shooting but their recollections were widely different and often exaggerated. Their schemas about the appearance and behaviour of terrorists might have sharpened and levelled their memories. The early study by Bartlett was not at all scientific. Bartlett did not follow standardised procedures, getting his students to reproduce the story as-and-when. He had no scoring system for measuring changes in recall other than counting the number of words. This makes his research conclusions subjective. Bartlett’s research was particularly unrealistic, getting Cambridge University students to recall Native American ghost stories. This strange task lacks ecological validity - although Bartlett claimed the task had to be strange so as to prompt the participants to level and sharpen the details in their memories. The Allport & Postman study is widely misreported. You will see many Psychology text books and websites claiming this picture (below) was shown to participants and that white participants wrongly recalled the black man as holding the knife. But this was not in the original study. This seems to be a case of ‘Chinese Whispers’ happening to psychologists! Reconstructive Memory has links to Tulving’s theories about Semantic Memory. Tulving argues our memory has semantic stores where we keep our understanding of relationships and rules – very similar to schemas. If Reconstructive Memory is true, this makes Tulving’s ideas more plausible. Moreover, semantic memory might have much more influence over episodic memory than Tulving imagined, because schemes dictate how we reconstruct our memories. A criticism of Reconstructive Memory compared to the other theories is that it doesn’t explain how memory is reconstructed. The other cognitive theories of memory describe the processes at work in rehearsing, retrieving and recalling. These processes have been linked to specific parts of the brain thanks to brain scanning and research on patients with lesions in specific parts of the brain. Reconstructive Memory is much more vague about how schemas work and where they are located. The idea of schemas helps us understand some things about patients with memory loss like Clive Wearing or people in the early stages of dementia. Though they may be confused by their amnesia, they might still remember important schemas and this could be used to calm and focus them. For example, Clive Wearing still loved his wife and loved music, which he could still play. Validation Therapy involves “going along” with delusional ideas so as not to cause distress when a patient’s schemas conflict with the real world. Elizabeth Loftus is often called to US courts as an “expert witness” to advise juries about how much trust they should put in eyewitnesses. Loftus has been involved in a number of “recovered memory” cases where someone receiving psychotherapy starts to recall sexual abuse from their childhood that they had not known about before. Loftus argues these are “false memories” based on leading questions from therapists and schemas about child abuse in the media. A weakness with the original studies into Reconstructive Memory is that they were not very scientific. For example, Bartlett showed how participants changed The War of the Ghosts to fit in with their own expectations and understanding, such as replacing canoes with boats. Bartlett tested his Cambridge students during tutorials and carried out one test in the street, two years later. However, in the ‘70s, Loftus did research into schemas with standardised procedures and experimental controls. She found schemas about car crashes made some participants falsely remember broken glass. Loftus followed standardised procedures that are easily replicated. You could apply the idea of schemas to helping dementia patients by going along with beliefs or activities that are meaningful for them. This is Validation Therapy and it is used at the “dementia village” in Hogeway where residents live in houses that fit in with their schemas. Reconstructive memory is similar to Tulving’s idea of semantic LTM. Schemas seem to be semantic stores and Tulving suggests that semantic memory can cause episodic memories to change, which is exactly what schemas do. The two theories are more valid since they support each other. In conclusion, reconstructive memory is a very important idea because it suggests that eyewitnesses may not be reliable. However, it is controversial because a lot of the studies into it are either unscientific or extremely artificial or both. In real life, our memories may be more reliable than this theory makes out. Notice that for a 8-mark answer you don’t have to include everything in the theory. I haven’t mentioned levelling or sharpening or the idea of memory being influenced by information acquired later. I haven’t described Loftus’ research into leading questions. But I have tried to make the two halves – Description and Evaluation – evenly balanced. Apply the theory of Reconstructive Memory. You are sitting in a lesson and suddenly hear a loud explosion outside. You run to the window with all your classmates and see a large cloud of smoke and people running around. You are questioned the next day by the police about what happened. Reconstructive Memory would explain differences in memory. If I had a schema about explosions that involved lots of fire, I might remember seeing fire as well as smoke. Somebody else might have a schema telling them explosions are due to terrorist attacks. They might remember dead or injured people or even gunfire. Loftus argues we incorporate later knowledge into our memories. So if I later heard that the explosion was a boiler blowing up, I might remember the explosion coming from the boiler room. Bartlett says we confabulate details by adding to our memories. We also rationalise them. I might rationalise the memory of people running around as people running away from the explosion.